Navigate through my family through the image below. Click the faces for linking. The families Kuld and Thau gathered at Birthe Thau's confirmation in spring 1952. Location: Birthe's home at Blidah Park 40, 1. t.v., 2900 Hellerup, Denmark. 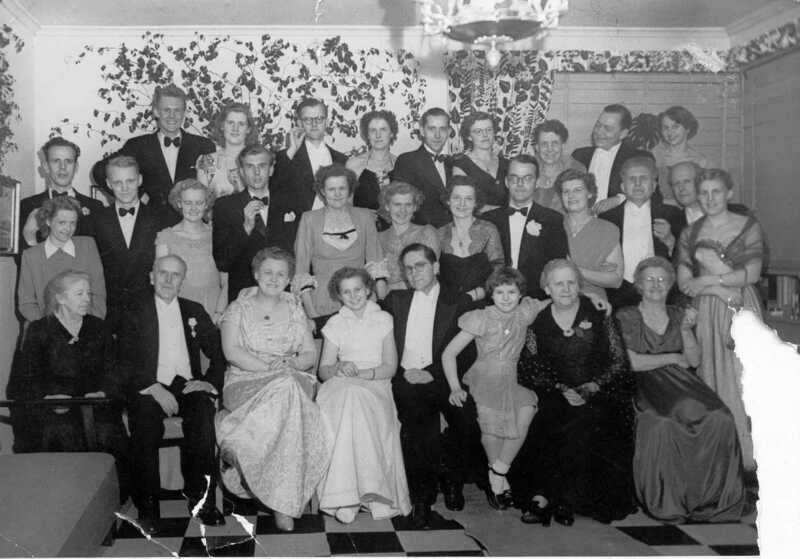 Front row: Karen Thau, Jens Martinsen Thau, Magda Olidia Kuld Thau (born Schandorff), Birthe Thau, Uffe Beiter Thau, Ulla Thau, Christiane Marie Thau (b. Beiter), 'aunt Doris' (sister of 'aunt Anna' and of Ester Lybeck's father), mother of Leif, Borg, Nina, Anne-Birgitte). Back/top row: [Fredleif's son Âœ name unknown], Ann Birgitte, High Court judge Borg (Ester's cousin, married to Mitzi, Leif's brother), Aase Thau Eriksen, Olaf Jarl Thau, Mrs. Bodil Thau (born Larsen, married to Olaf Jarl Thau), Gerda (married to Fredleif), Mogens Thau (married to 'aunt Gitte'), Mitzi (married to Borg). Charlottenlund Billed-Central, Olaf Poulsensvej 5 - Chrl. Helrup 3328 - Giro 75208.